After Colonel Tighs decision to impose martial law on the fleet, things were always going to get a little hairy. Tighs position is by now untenable. The combination of the pressure of command, too much alcohol and his sniping wife have left him making one bad decision after another. In this episode, we see him finally begin to lose his crew. After the drama of Kobol, this latest installment is somewhat weaker, mainly due to the events on Caprica. Starbuck and Helo are taken in by a bunch of resistance fighters who survived the initial Cylon attack. It's a fine concept, but it's execution feels a little too gung ho and hollywood. The excitement is again within the fleet as ships begin to refuse to re-supply Galactica until the Government is restored. Tigh sends in marines to secure supplies, which we all know is never a good thing. Meanwhile poor Tyrol - having just survived the trauma of Kobol - returns to find Tigh accusing him of being a Cylon because of his relationship with Boomer. This has always been an interesting story for me and the relationship gets some much needed screen time as Tyrol is forced to share a cell with Boomer. 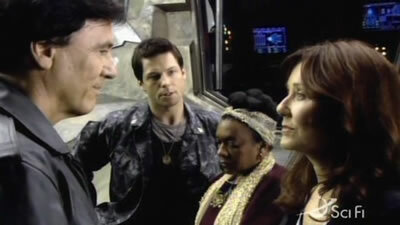 In the end it falls on Roslin to make a stand. However, it will have lasting consequences for many of Galacticas staff who are forced to choose between their imprisoned President and Colonel Tigh. The consequences, meanwhile, of Tighs poor decisions may finally come to the fore as we finally see an old friend get back on his feet. In summary, not so polished as recent eps; I feel this one is let down by the introduction of the resistance on Caprica. 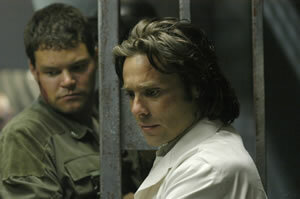 There are some superb moments between Baltar and Boomer, while having Roslin join forces with Zarek is a master-stroke. However, the scene-stealer is undoubtedly Adamas appearance in Tighs quarters.